Water Leaders Summit coming to Milwaukee May 23-24 | Vandewalle & Associates, Inc.
WATER LEADERS SUMMIT 2017 IS THE WATER COUNCIL’S HEADLINE EVENT FOR THE LOCAL, NATIONAL, AND GLOBAL WATER INDUSTRY. Register to secure your spot now. 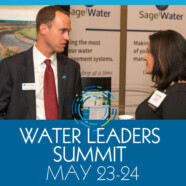 At the Water Leaders Summit–sponsored by the Water Council–you can join others who are thinking strategically about water and water security–and discover ways to turn water from risk to asset. Large, medium/small, and startup businesses from all over can participate in conversations and information sharing with other businesses, government, engineers, and researchers in the water space. Water Leaders Summit 2017 is a collision point for professionals looking for new technology, talent, business growth opportunities, and most important, ideas you can act on for changing how you work with water every day.